Centauri Dreams returns to its normal schedule on Monday, following a week devoted to the emergence of the Tau Zero Foundation. Next week will be a busy one, with a new and significant study of Proxima Centauri, a more detailed than ever look at the complicated happenings around Beta Pictoris, and a paper presenting a fast, beamed propulsion mission to Alpha Centauri serving as the highlights. If we had the will we would mount a D-Day scale invasion of space. The current space effort, as noble as it has been, was to send a handful of people out with car batteries and camping generators. This is not enough. We need to send out thousands with gigawatt powerplants and equipment to build industries. It should be about a historically large and grand vision, that will invigorate America and civilized nations. It will give a powerful reason for children to engage in math and science. As we contemplate moving forward in interstellar research, it’s important to emphasize where exploration fits into the broad pattern of human history. 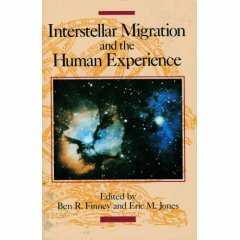 A book that anyone serious about interstellar issues should have on the shelves is Interstellar Migration and the Human Experience, edited by Ben R. Finney and Eric M. Jones (Berkeley: University of California Press, 1985). This volume is made up of the proceedings of the Conference on Interstellar Migration held at Los Alamos in May of 1983, an event attended by practitioners in a wide spectrum of sciences, from astrophysics to anthropology. Its insights into societal migration, emerging technologies and our evolving human future frame a debate that will engage us throughout this century and beyond. The whole history of Hominidae has been one of expansion from an East African homeland over the globe and of developing technological means to spread into habitats for which we are not biologically adapted. Various peoples in successive epochs have taken the lead in this expansion, among them the Polynesians and their ancestors. During successive bursts lasting a few hundred years, punctuated by long pauses of a thousand or more years, these seafarers seem to have become intoxicated with the discovery of new lands, with using a voyaging technology they alone possessed to sail where no one had ever been before. Once their attempts to cope with the rising sea levels of the Holocene committed them to sea, the first pioneers of this lineage of seafarers had good reasons to keep going. The continental mind set of their distant ancestors would have faded as successive generations pushed father and farther east, to be eventually replaced by the more accurate view that the world was covered with water through which bits of land were scattered. They therefore knew that in pushing into the open ocean they were entering not a vast empty region but one teeming with islands. What is more, after leaving the Bismarck Archipelago and outdistancing their less sea-adapted rivals, they would have realized that before them lay an ocean of islands accessible to themselves alone. What more invitation did they need? These Stone Age voyagers may be our closest analogue to future interstellar travelers. Finney believes that the early pioneers who push into the Solar System will have so thoroughly adapted to the space environment that they — and not those who have remained behind on Earth — will be the ones likely to move on out into the Kuiper Belt, the Oort Cloud, and eventually to nearby stars. It’s an incisive and insightful comparison. Like the ancient Polynesians, we stand on the shore of a limitless ocean, and the belief here is that interstellar travel is hard-wired into our genes, no more stoppable than the tide. I concur with the pioneering comparisons completely. It might serve to draw an analogy with de Gama and Columbus here, in that explorers of their ilk were willing to go against the superstitions and assumptions that the vast majority of their societies held. They went on out into unmapped territories that were believed to be replete with dangers – and indeed they were, though not with the monsters etc. that people expected to find, but with challenges which, although more mundane, stretched their courage, strength and will to near breaking point. The colonisation of space will be the same, I think – only the dreamers, the visionaries and the desparate will go at first. Once the trail has been broken, the others will follow. But by then the pioneers will have moved further out. Unlike this beautiful but finite planet we live on, there is no perceivable end to the untamed wilderness that awaits us beyond the gravity well. Let’s get moving, before it’s too late. That’s one of the more beautiful phrases I’ve run into recently — “the untamed wilderness that awaits us beyond the gravity well.” Nicely put! My State Library has a copy of that book – I’m sure I’ve flicked through it years ago. Will have to put in a request via a lending library. As for interstellar destiny, the emergence of intelligence and a species destined to fill the Hubble Sphere is required by Frank Tipler’s Omega Point theory – in all possible Universes with the Omega Point end of time such species MUST arise for the laws of physics themselves to work. If physics is for us, who can stand against us? Statements such as “Finney believes that the early pioneers … will have so thoroughly adapted to the space environment” make sense only once you realize that the only “thoroughly adapted” pioneers will be pure information (i.e. artificial intelligences or mind uploaded humans) because only they can have sufficient redundancy that they will be able to tolerate the hazards that space imposes and exist there with minimal costs in terms of matter and energy. There will be no “those who have remained behind on Earth” The Earth will have been disassembled. By the time we have the resources to migrate around the galaxy there should be a universal understanding that remaining in a “pre-ultimate-entity” state is pointless. They will most likely have died out having realized that bio-humans were simply an interesting step in evolutionary process (as were bacteria) but ultimately an inefficient use of resources. Again, “…move on out into the Kuiper Belt, the Oort Cloud,” makes no sense. They will have been disassembled and used for computronium. The statement “eventually to nearby stars” has to be constrained to a meaning other than the way it is commonly understood. What we currently consider to be “nearby” is not nearly close enough. Interstellar “travel” will wait until the stars pass close enough (probably within parsecs) to allow efficient splitting of the civilization. Advanced civilizations multiply by splitting off a significant fraction of the civilization (as do microorganisms) not by sending out little canoes or ships. which contains a discussion of his fascinating, mega-scale Matrioshka Brain concept, and links to numerous articles. Mr. Bradbury, you seem to have some fascinating ideas, and I look forward to reading through them. Interstellar Migration and the Human Experience is a unique and fascinating book, which I was very pleased to find in a secondhand bookshop one day, but the conference it grew out of took place nearly 25 years ago. While I don’t think the future course of history is necessarily as certain as the singularitarians make out, clearly it’s time for another look at the topic in the light of nanotech etc. (Interstellar Migration and the Transhuman Experience perhaps …) Maybe a job for the Tau Zero Foundation? An outstanding idea for the Foundation, and I thank you for the thought! One point, in defense of “anthropocentrism”, is that such Brains are at best an extrapolation and not Destiny. Also humans each begin as tiny, tiny fractions of the Whole they become. So too interstellar colonisers versus Brain World building. You’re looking at the wrong end of the lifeline. Finally, the limits of computation mean that even fairly simple proteins are beyond perfect emulation by mere computation. Actual physical ‘models’ that replicate them perfectly would be needed – thus not effectively different from the real thing. There will be always something more to learn even for august entities like Matrioshka Brains. Always a role for actual exploration. That being said there’s no reason why civilisations that have become Dyson Brains should do more than sending out self-replicating von Neumann probes, which would allow every star in the Galaxy to be continually monitored ‘on location’ within a few million years. There’s enough free mass in our Solar System for a vNM to arrive every thousand years, make a new probe or 3, and then sit and watch. Millions of vNMs could be orbitting in the Kuiper Belt and we’d never know. Especially nanotech versions. However considering the degradation of ‘genetic’ information via cosmic rays I’d say any truly long term vNMs (>10,000 years) would need to be macroscopic, using something more durable than molecular media. Some kind of Babbage machine with large/small mechanical memory might be durable over billennia? ideas on what may happen down the road of existence. second nature to them and they essentially “de-evolve”. truly advanced beings, why would they talk to us? but reaching other minds in the Cosmos. and marked the start of a new epoch. in the journal GSA Today. a new epoch – the Anthropocene.